Contents: M.J. Cox, J. Brooks-Gunn, Preface. M.J. Cox, J. Brooks-Gunn, Studying Conflict and Cohesion in Families: An Overview. G.R. Patterson, A Proposal Relating a Theory of Delinquency to Societal Rates of Juvenile Crime: Putting Humpty Dumpty Together Again. D.A. Obeidallah, L.M. Burton, Affective Ties Between Mothers and Daughters in Adolescent Childbearing Families. L.M. Prado, H.J. Markman, Unearthing the Seeds of Marital Distress: What We Have Learned From Married and Remarried Couples. M.J. Cox, B. Paley, C.C. Payne, M. Burchinal, The Transition to Parenthood: Marital Conflict and Withdrawal and Parent-Infant Interactions. E.M. Cummings, A. Wilson, Contexts of Marital Conflict and Children's Emotional Security: Exploring the Distinction Between Constructive and Destructive Conflict From the Children's Perspective. L.F. Katz, B. Wilson, J.M. Gottman, Meta-Emotion Philosophy and Family Adjustment: Making an Emotional Connection. M.S. Forgatch, D.S. DeGarmo, Two Faces of Janus: Cohesion and Conflict. R.D. Conger, X. Ge, Conflict and Cohesion in Parent-Adolescent Relations: Changes in Emotional Expression From Early to Midadolescence. J.A. Graber, J. Brooks-Gunn, "Sometimes I Think That You Don't Like Me": How Mothers and Daughters Negotiate the Transition Into Adolescence. S.I. Powers, D.P. Welsh, Mother-Daughter Interactions and Adolescent Girls' Depression. S.J. Suomi, Conflict and Cohesion in Rhesus Monkey Family Life. R.C. Kessler, M.S. Forthofer, The Effects of Psychiatric Disorders on Family Formation and Stability. 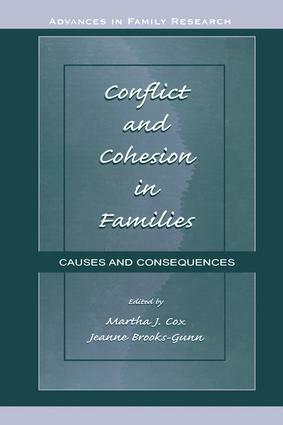 M.J. Cox, J. Brooks-Gunn, B. Paley, Perspectives on Conflict and Cohesion in Families.